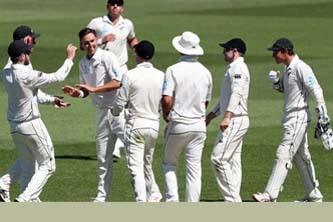 Wellington despite injury concern to several players as they seemed to be upbeat by the performance in the three-match Test series opener in the last week. The second Test starts at 4am (Bangladesh Time) on February 8 (Friday), a match dubbed as ‘do or die’ for them considering that a defeat would cost them the series following their ODI debacle. Regular skipper Shakib Al Hasan’s International return was delayed again, Mushfiqur Rahim is yet to recover fully from the wrist as well as rib injury and opener Tamim Iqbal also has niggles. Bangladesh head coach Steve Rhodes expected Tamim to be adequately fit but said that Mushfiqur Rahim is extremely doubtful for the second Test. Such was their performance that even the New Zealand skipper Kane Williamson admitted to be scared at one point of the game. Soumya Sarkar blasted 149, stand-in skipper Mahmudullah Riyad smashed 146 while Tamim Iqbal hit the bowlers all corner of the park to clobber 74, following his 126 in the first innings. All of the Bangladeshi batsmen scored runs at great pace, enjoying the true bounce the Hamilton pitch offered. “When the bounce is true, Bangladesh players could be dangerous because they love to play attacking cricket. It’s a matter of adjustment to the wicket just which they couldn’t do in ODI series,” former national skipper Gazi Ashraf Hossain told the BSS on Wednesday. But in the first Test, they looked to cope with the condition, at least in the second innings, he added. In Wellington, Bangladesh are also expected to get that true bounce again. And if they could adjust well, there is possibility that they could fight their way back, Ashraf added. The wicket was so good to bat on that prompted Mahmudullah to rue for missed opportunities as he felt they should do well in the first innings. According to Mahmdullah, if they could put up good score on board in the first innings, there was possibility that they could pose more challenge to New Zealand. “The wicket was really good to bat on and we missed our opportunity,” Mahmudullah said after the first Test.